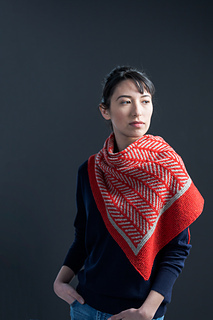 Redshift is available as part of Jared Flood’s first print book, WOOLENS, available at brooklyntweed.com. 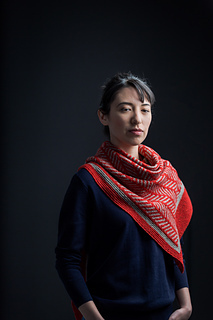 Redshift is a project for the adventurous spirit — a graphic shawl knit circularly to a point in stranded colorwork, opened with a hand-sewn steek, and finished with a multi-directional garter edge. This shawl is the perfect opportunity to expand your skill set and add a jolt of energy to your wardrobe. 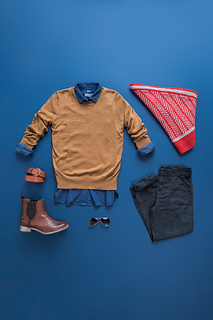 Wear it loud and proud with a bright, high-contrast color combination or tone it down with a subtle pairing of neutrals or closely related hues from the Loft palette. Note: Be sure to swatch for both gauges. 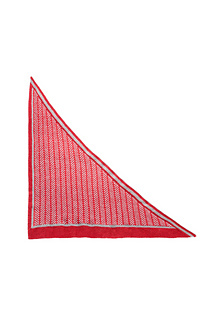 The correct proportion of the shawl depends upon achieving a square gauge (same number of stitches and rounds/garter ridges in a given measurement). Please read about Speed-Swatching for Circular Knitting in Special Techniques. 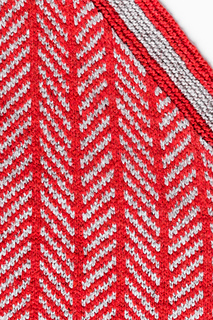 Due to significant variance between knitters, your colorwork fabric should be swatched prior to knitting your shawl to determine whether or not this needle size should be larger, smaller, or equal to the size used for the edging. Please read about Speed-Swatching for Circular Knitting (see Special Techniques). 32” circular needle can be used instead of DPNs if using the Magic Loop method for working small circumferences in the round (e.g., the end of the shawl). 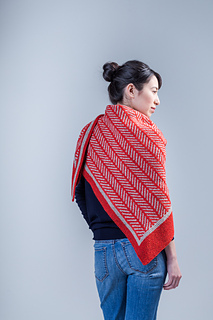 Please note, the stitch patterns in this shawl are charted only.